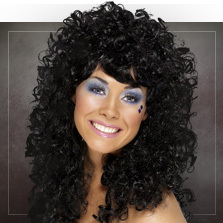 These costume wigs are the best solution for you to finish putting a costume together. There are costumes that just aren't complete without the right hair! At Funidelia you can buy wigs and accessories for you to dress up in any style, colour and as any character you can imagine. That way you will enjoy the Carnival, Halloween or a party in the best costume possible. 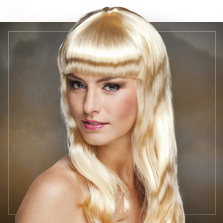 Have a look at our catalogue and discover our selection of wigs for original and fun costumes. You will find wigs that are blonde, brown, multicoloured, afro, long haired, short haired, with a fringe, with straight hair and curls... Could you imagine Harley Quinn without her colourful pigtails, Pippi Longstockings without her braids or Elvis without his tupé? We can't either. You could even transform yourself into the Ice Queen and sing to the sound of "Let it go!" with a Frozen wig. 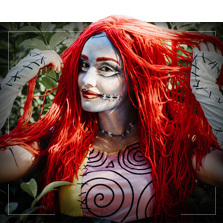 These carnival wigs are available for adults and kids and the costume you choose will look even more special with the right wig to help people identify your character better. But you don't have to put on a famous person's costume, with a great wig for your Carnival costume you can transform into a disco bailarina, Maria Antoinette or into a clown from the circus world. 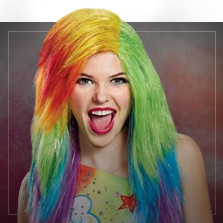 Show off the most amazing hair at the party with some fun wigs!